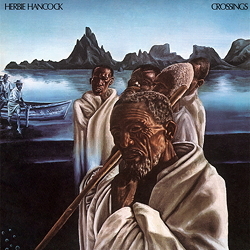 "Crossings" - Herbie Hancock (el-p, p, mellotron, perc); Bennie Maupin (ss, fl, b-cl, fl, perc); Eddie Henderson (tp, fhg, perc); Julian Priester (tb, perc); Patrick Gleeson (synth); Buster Williams b, perc); Billy Hart (dr, perc); a.o. Nevertheless, the excellent trumpeter Eddie Henderson – often underestimated as an improviser and composer, and Benny Maupin – who like Hancock had grown up under Miles Davis’s wing, present a wide range of sound-generating instruments – as was all the rage in those days. Synthesizer and Mellotron (a polyphonic tape replay keyboard and as such practically the prototype of the sampler) were permanent members of the group – and even produce here melodic arches of sound! Whether Bennie Maupin’s "Quasar" launches the group and us into extraterrestrial territory (as stated in one review) is a moot point. This LP is a contemporary historical document, though it certainly doesn’t sound antiquated. That’s why younger listeners too will find pleasure in this experiment from the previous millennium.